Experience is everything: Etnies, who have been active in the skate and BMX sector for years, now also offer bike shoes. And it gets even better! In the development of their shoes, they have sought help from none other than freeride legend Brandon Semenuk. What else can go wrong? Are you using clipless MTB shoes, which offer you a fixed connection with your bike at any time or are you a lover of MTB flat pedal shoes? Loose, relaxed flat pedal shoes also offer a good grip for the pins of the flat pedal variant thanks to their softer sole. They are the more popular version with all-mountain bikers, downhill and free riders and appear more like a leisure shoe in sneaker shape. Some MTB shoes also offer additional studs which can be screwed on or taken off. This supplements the already coarse sole additionally and gives your foot a better grip. The difference between MTB and clipless road bike shoes is based on the different pedal shapes for mountain and road bikes. You can recognize the difference in the shoe soles right away. An MTB shoe provides more profile so that the foot has always a good grip even off road when walking. When looking at the road bike shoes for the road, the relatively flat sole catches the attraction right away, and the plate is screwed underneath with 3 screw openings while a small piece has been "inserted" into the sole of the MTB shoe owing to an existing recess and fastened with 4 screws. The controversial "perfect pedal stroke" (if it at all exists) has to be exercised for an optimal force transmission. Thanks to the clipless system, you can transmit your power not only by pressing the pedals but also by pulling (pulling and pressing movement). That is why one usually looks for an especially stiff sole of the shoes which supports the force transmission. 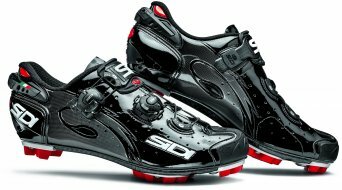 For MTB or road bike racing shoes the stiffness of the sole is an important purchasing argument, which makes them appear uncomfortable for inexperienced users. The contrary, for example, are softer all-mountain shoes, which are chosen in order to be able to master one or another carrying passage comfortably on foot at the next alpine trip or the next trip to an alpine cabin. No matter whether all-weather, winter, light race shoes or touring shoes. It applies to all of them: Make sure that your shoe precisely fits to your foot. Otherwise pressure and chafing marks will be responsible for longer tours becoming an agony. When you try them on, you have to wear the socks which you will be wearing on your bike tours, and do not necessarily test the fit in the early morning hours, more like in the course of the day when the feet might be a little swollen. No matter if you need a professional biker shoe or a comfortable leisure model, or MX boots, you will find a quite large selection in the shop, for a better overview sorted into categories and there will be models affordable for everyone. From more favourably priced models to expensive professional shoes from top brands. You will even find replacement shoe buckles or insoles for your bike shoes if you look for them under spare parts. The matching summer or winter socks for bike riding are offered as well as are overshoes for bike shoes. Overshoes should not be missing in any bike wardrobe, since especially when the temperature and the weather do not exactly stand on the sunny side, additional overshoes will keep your feet warm and dry.